The Investor Who Took On Uber, And Silicon Valley : All Tech Considered In Silicon Valley, you're supposed to build businesses unapologetically. You're not supposed to speak out against injustice. Freada Kapor Klein breaks those rules. 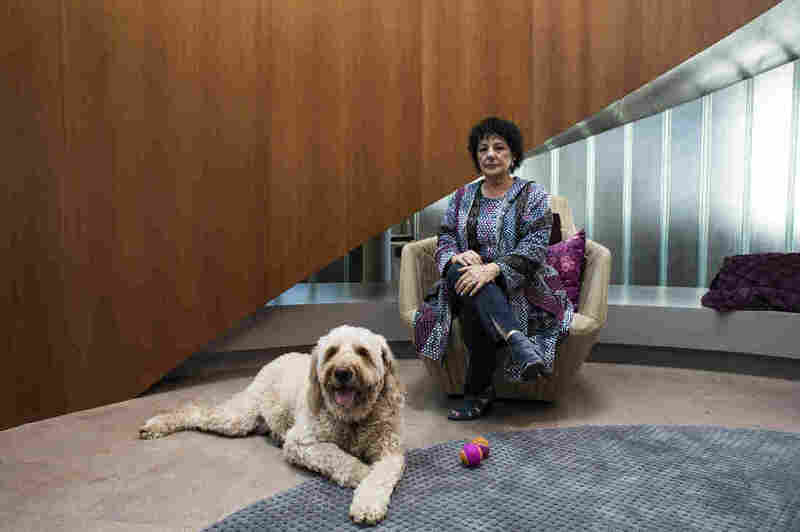 Freada Kapor Klein stands on a staircase at the Kapor Center for Social Impact in Oakland, Calif. She is a high profile investor, who invested early on with Uber. She has used her voice and her money in a decades-long effort to promote more diversity in Silicon Valley. But there is one Uber investor who stands out for how she decided to speak up. It was not very Silicon Valley-like of her, but Freada Kapor Klein wanted to turn the crisis into a teachable moment. And while this week's events could lead her to say "I told you so," she has a different takeaway. Let's rewind a few months. Kapor Klein decided to write an open letter to Uber — which she published with her husband — after a young woman shared an explosive account of sexual harassment at Uber headquarters. Kapor Klein is a venture capitalist, or a VC. That means she makes money by betting on technology startups. Uber is one of those startups. She has committed to "impact investment" — businesses that can turn a profit while also making the world a better place. For too many years, she says, critics would question her on Uber, and she stayed silent. She tried to influence the company from the inside, though she didn't see a real will among leadership to change. While "Silicon Valley prides itself on pattern recognition," the letter said, Uber had "toxic patterns" that needed to stop. Kapor Klein thought she was just saying what insiders knew: This is not a one-off. Turns out, her peers didn't like that and wanted her to pay for it. "I could imagine that they wouldn't love the Uber letter," Kapor Klein says in an interview with NPR in mid-March. "But then that they would decide the next step they ought to go, is go after our high growth, hot startups and try to get them away from us!" Anthony Heckman, an associate at Kapor Capital, speaks with Kapor Klein. She wrote an open letter to Uber after an engineer shared an instance of sexual harassment at the ride-hailing startup. She's just learned that other VCs are trying to poach one of her hottest investments, and they're citing the Uber letter to do it, basically saying: this investor throws her own people under the bus. "I mean, it's one thing to go pitch them. It's another to say, 'Get away from Kapor. See, they're going to do this to you,' " she says. It may be counterintuitive, but in Silicon Valley, the land that created tweeting, there is a code of silence among the rich. People are here to make money, not to agitate. She violated that code. But she won't back down. She tells me I should call a shortlist of her most powerful peers and demand they respond on the record. "Go to Sequoia, go to Benchmark, go to Kleiner, go to Accel, go to Andreessen, go to Khosla," she names the kings of much-storied Sand Hill Road in Menlo Park, Calif.
She's sitting inside the Kapor Center for Social Impact — a name that spells out the intent of the place. Kapor Klein and her husband bought this four-story building in central Oakland — what's become the edge of Silicon Valley as tech expands beyond Cupertino, Mountain View and San Francisco — and it houses an investment arm, research and philanthropic projects. Dudley's snoring breaks her concentration, and she lets out a laugh. He's a rescue dog, but sometimes she claims he's a therapy dog. "You can see why. Doesn't he make you feel better?" She wakes him up and the two go in search of her husband and business partner, Mitch Kapor. When they find him, he happens to be meeting with the president of Silicon Valley Bank — who is trying to not get in the middle of the couple's conversation. But Kapor Klein reels him in, telling him about the letter and the response. Greg Becker politely offers his take: "Yeah, people compete ... anyway they can, right? That's — unfortunately it's human nature ... ."
Kapor Klein points to her dog, who is now rubbing his enormous cream coat against the banker's leg, and she teases: "I thought it was just dogs that did that. Dogs, not humans." Her husband ends the conversation by saying: "It's a dog-eat-dog world." This is his way of acting as her buffer — she, the one who pushes; he, the one who moderates. 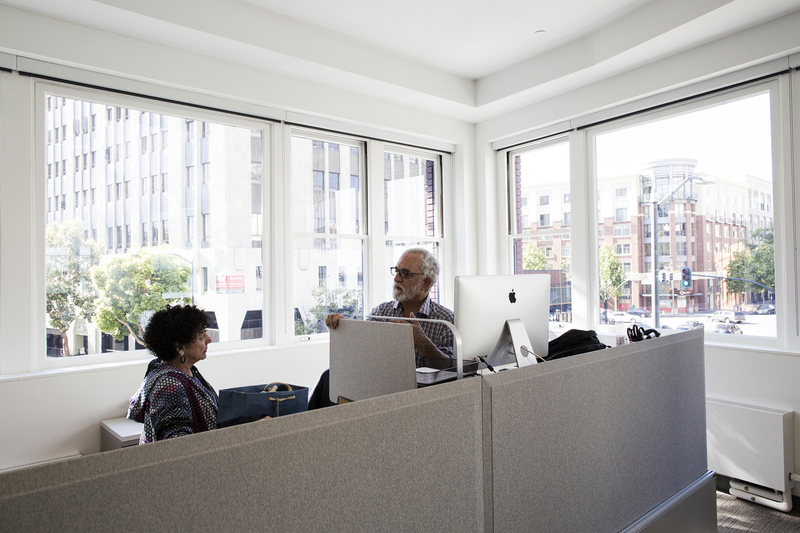 Kapor Klein talks with her husband Mitch Kapor in their shared office space. He founded Lotus, the database company, and is a legend in Silicon Valley. Mitch Kapor is a bit of a legend, by the way. In the 1980s he founded Lotus, the famous spreadsheet maker. Some compare him to Steve Jobs and Bill Gates. He pulled Kapor Klein into the tech world when he hired her to fix Lotus' culture in 1984, to make it the most progressive employer in the U.S. Quite the job description. She would lecture her boss about how he carries himself at work, how he should be "more sensitive" about his power, how he could make or break an employee's day just with eye contact. The couple didn't get together until years later, when she sought him out for career advice; and his second marriage fell apart. He asked her out on a date. He had a son and a daughter. She was 43 and didn't have kids. She assumed it was a summer fling and warned him, date two, that she's not "stepmom material." Turns out, it wasn't a fling. Her life's work is to change the culture of Silicon Valley — a place she feels has gone backward in time. There are far fewer women in computer science today than in the 1980s. Blacks and Latinos are missing too. Kapor Klein faults the investor class, which holds on to the myth of meritocracy, that they are the hyper-rational conduits of capital and it so just happens that white men are the most worthy. She shares a hokey saying she's heard one too many times: "We don't care if you're orange or blue; the only color we care about is green." 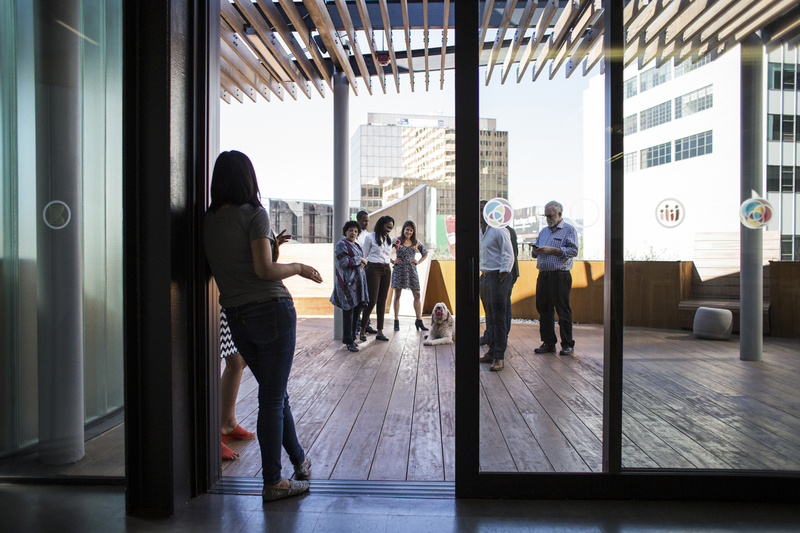 Kapor Klein talks with communications manager Ashleigh Richelle (left) and the summer associates at the Kapor Center for Social Impact. 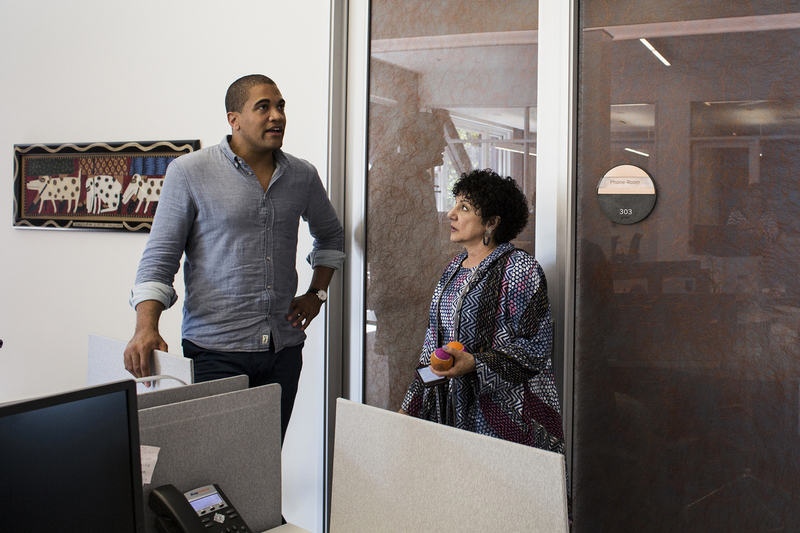 Kapor Klein's life work is to change the culture of Silicon Valley. If all Kapor Klein did was critique, she'd be irrelevant here. This place values people who build things. And that is what she is doing. The building feels like an alternate universe — one where tech somehow looks like the rest of America. On one floor, there's the investment team. Their portfolio includes Genius Plaza — the hot startup that others now want to poach. It's an online education platform founded by Ana Roca Castro, a woman from the Dominican Republic (which is exotic in these parts). She's landed major contracts with national agencies throughout Latin America, and is working to get into more U.S. schools. Castro, who is based in Albany, N.Y., describes Kapor Klein as "protective," an early investor who tries to shoo away others who don't share their values. Asked if that could mean possessive, the tech founder disagrees. "When someone is territorial they want nobody around," but in multiple instances, Kapor Klein has opened doors she didn't know to knock. "She'll be the first to push me, saying, 'Don't be afraid.' 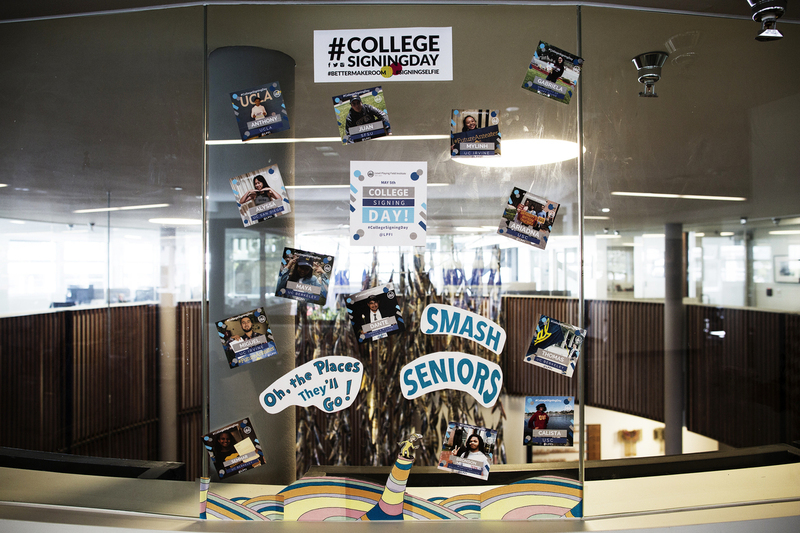 "
Pictures of Kapor Klein's SMASH scholars and which college they will attend are on display in the office. Downstairs, Gabriel Chaparro — who ran the center's SMASH math and science program for students of color at Stanford — shares the lesson he wants to drill into young minds. "You're going to step into places where there's a line of people and none of them look like you. But you've earned your space. So get in that line, push them aside," he says. "You can't just look at that line and say I don't fit in there. Make your fit." It's a very Silicon Valley way of being. It's how Uber CEO Travis Kalanick broke the yellow cab industry in city after city. In some ways, Kapor Klein wants young people who grew up poor to channel Silicon Valley's sense of entitlement — the idea that it's OK to fail; that failure is necessary; and that one deserves support anyway. She herself doesn't come from money. She grew up on a U.S. Air Force base in Biloxi, Miss., and one of her earliest memories was seeing, at age 3, her 7-year-old brother bloodied, beaten for being a Jew. She knew then the world isn't fair. The Uber row isn't her first in Silicon Valley. To some extent, she's used to it. She is rich (she won't disclose how rich) and travels in wealthy circles, where people have strong feelings about money. She remembers a billionaire who suggested she's spending too much on her do-gooder education programs. She recollects telling him, "Well, you probably write a check that's somewhere between five and 10 times that amount of money for private kindergarten for your child." She's quick to point out, though, that she jabbed because she was asking him to donate. If there wasn't a specific ask, a concrete step she was advocating, she said she would hold back. Kapor Klein sits with her rescue dog, Dudley. He acts as the office's therapy dog and follows her throughout the day. NPR did approach leading investors (as Kapor Klein suggested) to get their take on Uber, her letter, and what's the real problem. One was willing to go on the record. "If you are a shareholder in a company and a stakeholder in a company, you would want to speak with one voice and you would want to work on the problem primarily," says Jason Calacanis. "To kind of blindside a company with a post like that means now the company not only has to solve the problem, they have to react to that position publicly." Calacanis is an influential angel investor, and author of a new book on how to invest. While he respects Kapor Klein's work with the underprivileged (he's invited her to speak about it to his startups), he says that the way she spoke out created a "negative atmosphere" — a media circus. And, Calacanis adds, it takes a hard-charging CEO to build the Uber empire. Soft questions around culture, an inclusive culture — those come later. "After you've won, or won a decent amount of market share or won the early fights, I think you have to shift gears a bit. And I think that's what Uber's going through." Kapor Klein disagrees — and Uber's monumental meltdown is arguably proof she was right. But when I sit down with her in April, as the drama continues to unfold, she's become hesitant. Uber reached out to her for help, after her letter. Now, as I ask questions about it, she's being tight-lipped. Asked if she is uncomfortable, she says she is, "because my goal now is to help Uber and any other company that really genuinely wants to change. I don't know what snippets you might use, how they might hear that, and whether that's going to hamper the efforts." Kapor Klein wants the world to understand: Yes, she spoke out when others would not. But no, Uber isn't the only problem child in Silicon Valley. They just happened to get caught. This week she and her husband issued a statement to that effect, saying "the company deserves some room" to work on itself. 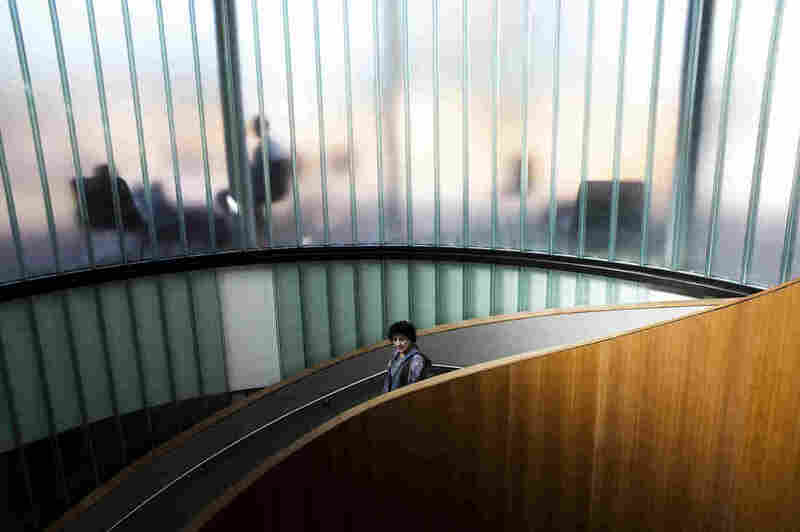 A previous version of this story said that Freada Kapor Klein and Mitch Kapor became a couple after his first marriage fell apart, and that he had a son. In fact, it was after his second marriage fell apart, and he had a son and a daughter.